So we jump straight into My Friend Pinto and as far as the story goes, the main one [yes, there are more than one] is about Michael Pinto [Prateik Babbar], a Goan lad that has his world shaken up because his dear mother has passed away. So sad. But wait, there is a bright side. With no-one else to turn to, Pinto decides to go the big, bad city of Mumbai in search of his childhood friend Sameer urff(aka) Sam [Arjun Mathur]. Along the way, he saves the life of a Mallu Don [Makrand Deshpande], saves a dog that is given to said Don’s muse [Divya Dutta] but loses his wallet in the process, and basically becomes a magnet for trouble, all in one night. Throw in a few life lessons, a cute aspiring dancer/ladylove named Maggie [Kalki Koechlin] and a few songs and voila, you have a light hearted giggle-a-thon. Not exactly. Sometime noble intentions are not enough to make an impact on the big screen. For My Friend Pinto, the story of simpleton coming to the big bad city maybe basic but it isn’t all it entails. Yet when it adds in a few [or many] subplots to make the proceeding a little interesting, the concoction that becomes the film just doesn’t work. Ok so maybe I’m jumping ahead a little and being a big harsh. After all, sometimes you need to look at the simple things in life to enjoy it. Maybe that is why Sanjay Leela Bhansali decided to step away from his larger than life canvas films with deep, meaningful and heartfelt stories of human emotions. Maybe he wanted to do something a little different, lighter with some fresh upcoming talent like Prateik Babbar and Kalki Koechlin in the lead roles. Noble intention, indeed, for the film is essentially about seeing the good in your fellow humans, friendship and making your own destiny. Alas, SLB’s My Friend Pinto isn’t working too well on that front either. That’s not to say it is all bad. Yes, it does induce a smile or two here and there. But with the confusion of the plot, the multiple characters that are half baked and the situations which you can see happening, it does make it hard to remember them all after you’ve walked out of the film. On the acting front, Prateik is improving with each film and while you do get the feeling on occasion that he isn’t as innocent as Pinto, the attempt to be charming is sincere. Kalki doesn’t enough screen space to make this impact she needs and what’s more the character itself is sketchy. Makrand playing a Mallu Don may have been funny on paper but on screen, it doesn’t sit very well. Divya Dutta surely deserves better than this and Shruti Seth’s animosity towards Prateik isn’t explained very well, making her character a tad annoying. The rest are just so so. With pretty much everything falling out of place, it’s not going to be easy to save this. Editors Shan Mohammed and Dipika Kalra try to snip it back together in a desirable way but unfortunately, fail. The cinematography has some unique shot added in to it and it is appreciated. Sadly, the writing plays spoilsport to such visuals. The music by Ajay-Atul too leaves much to be desired, although it seems to flow with the film ok. 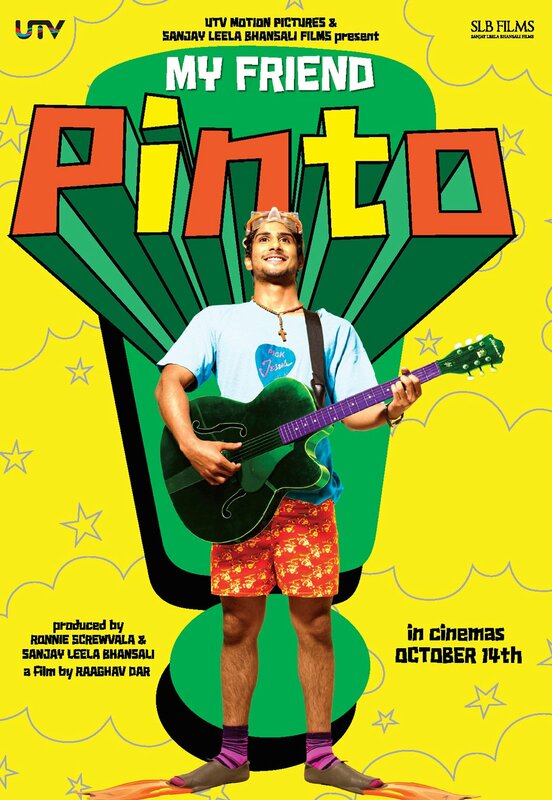 So what is left to watch in My Friend Pinto by debut director Raghav Dhar? Well, had there been a little more depth into Kalki’s character/relationship with her mother or maybe proper giggle worthy material for Makrand and crew to work with, a nice comfy couch-and-popcorn worthy film, maybe. But all that you are left with is the thought that the film was meant to be funny and charming but wasn’t.